You all know how much I love the work of Etsy seller RockyTop Design. 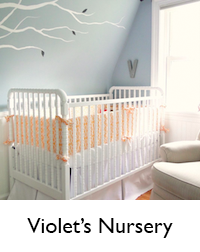 I've used shop owner Jayna's custom crib bedding in Violet's nursery and also choose fabrics from her shop for most of my nursery idea boards. If you want to make your nursery truly unique and get a designer look, custom crib bedding is a fairly inexpensive and easy choice. 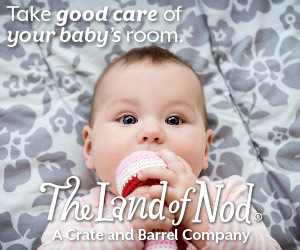 RockyTop Design has generously offered to give away a $30 gift certificate to the shop, which can be used toward whatever you need to complete your baby's space - from changing pad covers to crib bumpers, sheets, skirts and more. And for you readers who aren't parents - we didn't forget about you! 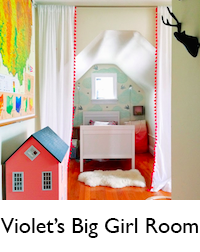 RockyTop Design also offers custom pillows, window seat cushions (like the one in Violet's nursery), window panels, and valances. Visit RockyTop Design on Etsy and leave a comment telling us which fabric is your favorite and how you would use it in your home. You can earn up to ten entries if you choose all of the above! If you already follow wtc, just let me know in your comments. Entries will be accepted until 11:59 PM EDT on Thursday, September 30th. One entry in each category per person. Spam entries will not be counted. Spam entries are determined at the sole discretion of with two cats. For blog-based entries, the blog must be a legitimate blog and not a “spam” blog, or a blog set up purely for the purpose of entering contests. All rules are subject to change without notice. Love the Antiquity in Breeze collection...looking for valances! So gorgeous! 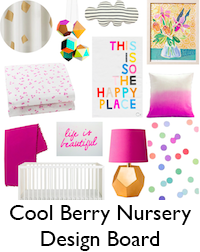 And perfect timing to, I'm starting to wrap my head around designing my next babies nursery! I'm pregnant with bub 3 so I'm looking at something with reds, lemons and pale blues. I have a 9 month old and I never found a crib skirt I love, so we have just a plain one. I would love using the Meadowsweet in blush, specifically the fabric marked "f" for a crib skirt. His walls are Fountain Spout by Behr and the accent color is Behr Canteloupe Slice. I love the Plain Jane in Gray. I'm already making the crib bumper and curtains, I would definitely love to have someone make me a changing pad cover. I would so be up for a navy blue, or gray color. She had so many to choose from I couldn't make up my mind! Thanks for the great giveaway! I love all the different fabrics, and will definitely keep the shop in mind for the future. i love the Woodland delight in Blue Grey (a)...i think it would make fantastic pillow covers for my living room! i also now a follower of with two cats! Also, I voted and I am now a facebook follower. Awesome giveaway, thank you! I love the midwest modern options! A changing pad cover would be awesome. I really like the lagoon mood fabrics. Maybe a big floor pillow for kids to read on? Your nursery is my FAVORITE. I send it to my friends to show them what inspires me for my own little girl (due in January). Cheers on the great design and the great blog. Would love to win. I love the Midwest Modern line! I love the Leanika in Blue D fabric - so pretty! 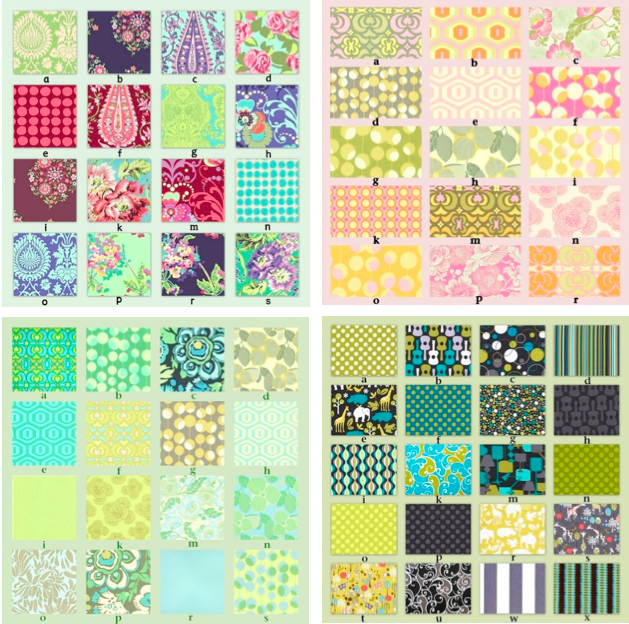 I love the fabric you chose for Violet's bumper - from the Garden Trellis Afternoon Collection. I'm also a fan of the "h" option in Amy Butler in linens. I think either would be perfect for our gender neutral nursery. I am also a follower of With Two Cats. Thanks! I am a facebook follower now, yay! I love the garden trellis in pink, but I know it is discontinued! Thank you! Great giveaway! I am expecting my first baby in December so the timing is perfect! I love the Owls in Blue Green design. I would use it for my grandsons crib. i also voted for you on top baby blogs! 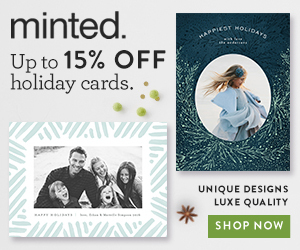 adore your blog! just started following you on twitter! I am expecting my second (a boy!) and have decided to decorate the room in JOel Dewberry fabrics and I need a bumper! This would be awesome to win! I loooooove Amy Butler fabric, and would choose to use some of that (possibly the Martini grey/mustard combination) for a custom-made valance? Oooo so many options! 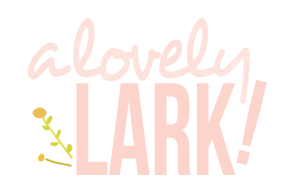 I'm already a follower and I LOVE your blog! Thanks for the great giveaway! Wow, there are so many fabrics it's hard to choose. But I think I'd go with something from the "Plain Jane in Gray" collection. I'm newly pregnant so it would go in our soon-to-be nursery. I'm 24wks pregnant with a little boy, I love reading your blog and love your style, so cute and funky which is exactly what I like!! 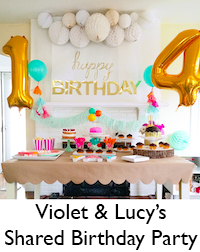 Congrats on Violet, she is a DOLL! I love the "Fandango in Azul by Kate Spain" fabric collection. I would love some throw pillows for the couch. I love the Plain Jane in Gray Collection but espically the poka dots fabric. Torn between August Sunset and Midwest Modern collections. And I am thinking pillows or a bench cushion. 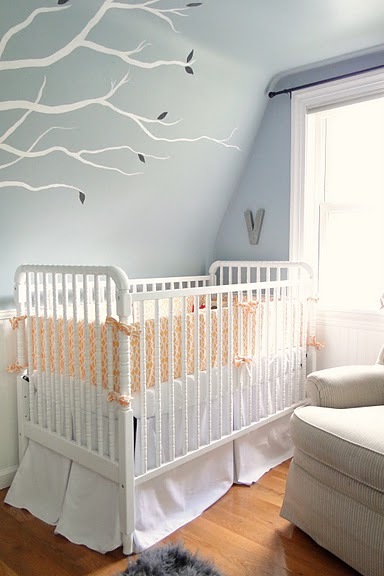 I absolutely love the fabrics in Garden Trellis Sunrise, I'm having a baby girl in December and would love to customize her crib bedding in these fabrics. I'm a follower on Google! I'm now following you on Twitter @soalaurable! Thanks to both of you for the giveaway! I love all the fabric in the Fandango in Azul set by Kate Spain. Awesome giveaway! I'm also a follower on facebook! I voted! Oh.. and I forgot to say in my first comment that I would use the fabric in the room of the baby we are trying to adopt. I love the primary dot fabric! And the primary diamonds as well. This is a beautiful set! !